Purpose: The aim of this study was to investigate the biodegradation of petroleum hydrocarbons in crude oil when added to Shambat soil in Sudan. Design/methodology/approach: A laboratory experiment was conducted in the Soil Science Unit laboratories at the Department of Environment and Environmental Pollution, ENRRI, National Center for Research. The experiment aimed to study the biodegradability of light crude oil, which was refined by the Petrodar Oil Company. Petri dishes were filled with Shambat soil, amended with three different concentrations of light crude oil and incubated at optimum temperature (37oC). Samples were taken after 2, 14 and 28 days following crude oil addition. The recovery of petroleum hydrocarbons was determined to calculate the biodegradation percentage. Findings: The results indicated highly significant differences among the various concentrations and sampling durations. The highest concentration of crude oil showed a significant decrease in biodegradation of petroleum hydrocarbons. 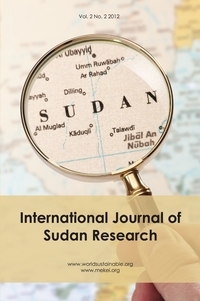 Originality/value: This research was carried out by four researchers from two institutions concerned with the environmental aspects of soil pollution due to the implementation of the oil industry in Sudan. The paper emphasizes the microbial degradation of total petroleum hydrocarbons in soils in order to facilitate management practices in polluted sites.